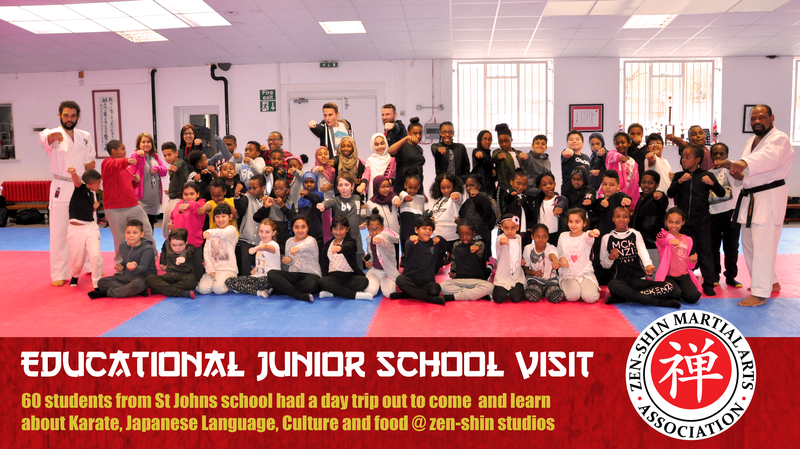 On February 9th 2017, 60 students from St John’s and St Peter’s C of E Academy came to Zen-Shin Studios in Handsworth to experience Japanese culture. They were learning about Japan in school, and wanted to get a taste of the culture from the Zen-Shin team. In our next room the students learnt Japanese with Sensei Afiya. The children learnt how to greet each other and introduce themselves in different situations. They practiced bowing and learnt about what it means in Japan and the importance of respect. Afiya also introduced them to the 3 Japanese writing systems, and the students had a go at reading themselves. The next room was more Karate with Sensei Abian. He showed them how to kick and punch, and let them practice hitting pads. They worked in pairs, which helped the children learn to cooperate with each other. Our last room was a showcase of some of the culinary delights of Japan. Sensei Jumoke showed them different types of chopsticks, and taught them how to hold them correctly. They tasted some traditional Japanese food like seaweed, gyoza (dumplings) and wasabi. It was a great opportunity for some of the children to eat something new for the first time. Zen-Shin would like to extend our gratitude to St John’s and St Peter’s C of E Academy. The students were all respectful and well behaved, and the staff were fun and supportive. All were a credit to your school. We hope everyone had a great day and learnt something new.